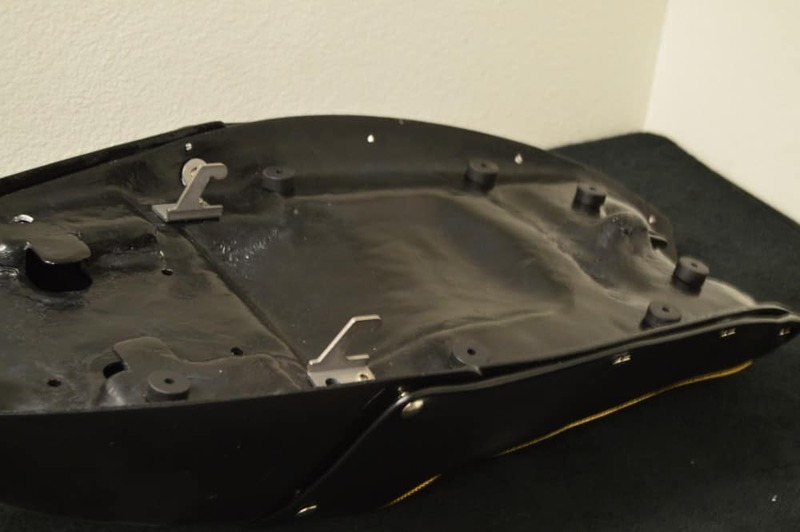 Well, I thought it was time I came up with a few more ideas for my Thruxton and this is my latest one, this is a cool seat base and cowl assembly, complete with a snap upholstery that gives you the opportunity of using the cowl as a storage compartment. 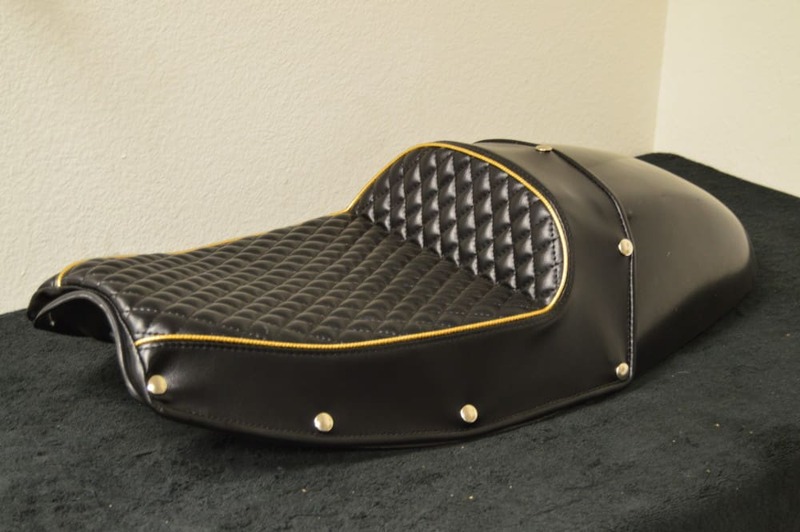 I have loved the race snaps for many years and used this style of quite a few of my creations over the years and thought it only fitting that I design and build one for my own motorcycle and of course, offer the same to you. These are not mass produced as i make these to order and what you get is personal attention with this assembly. 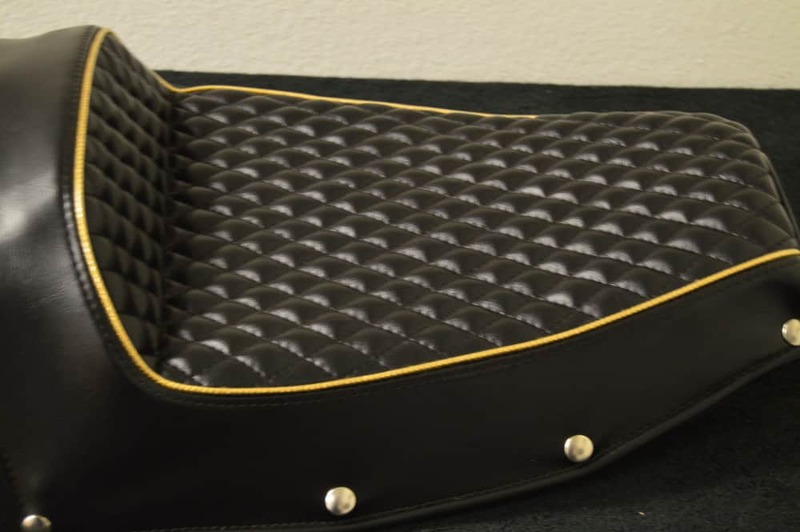 Have a look and see if you like this design, this is a new seat base, New Triumph rubber stops underneath and of course New foam and custom made seat cover with snaps, of which you can ask for different colored stitching too. 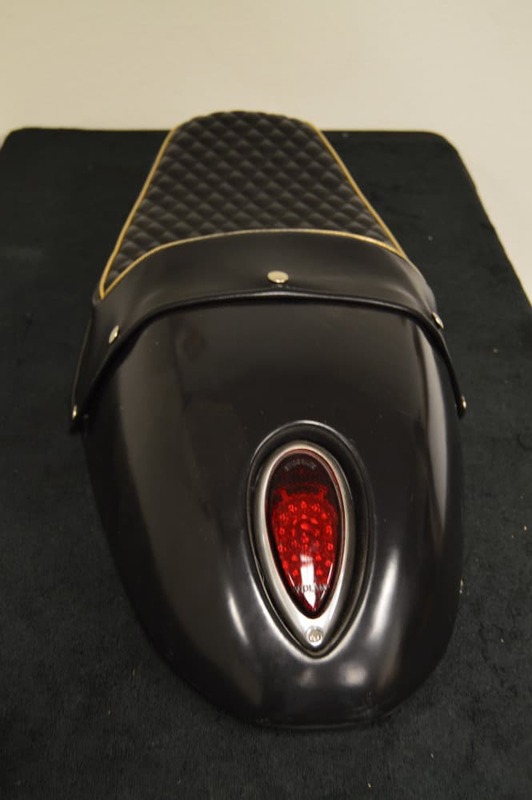 If you like the Nostalgic look and of course, you have a Thruxton, what cooler way than to go this route, as this gives you a superb option to get rid of that bulky Plastic stock rear tail light assembly as my Cowl comes complete with a Glass 12 Volt teardrop Light that is stop light and running light. I took a lot of time in deciding how I was going to go with this and I like the set up, it may not be your cup of tea but for me I can drink that stuff all day and of course I do so. So if you like this and would like to have one the same but different colored stitching, just email me on carpy@carpyscaferacers.com and I will make it happen as we can do red Stitching, Black, white or Grey, its up to you, you can also choose a different trim-Piping etc. 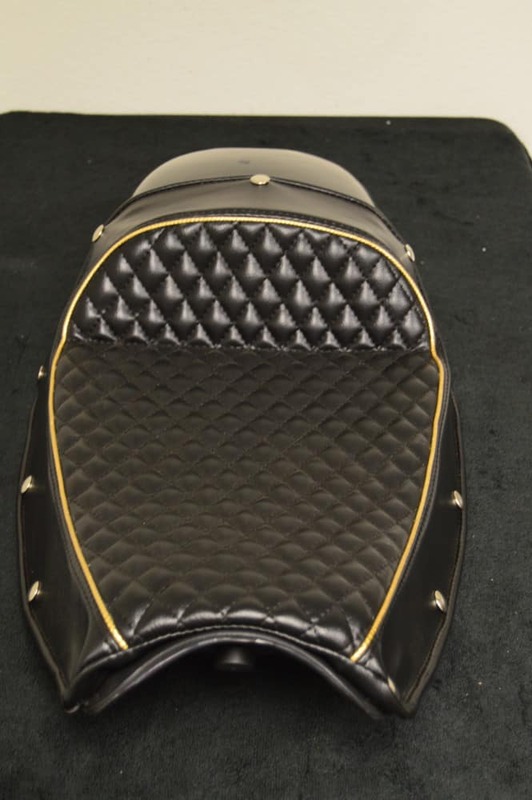 The choice is all yours, I shall add more photos once I have painted the cowl and fitted it to my Thruxton for you to see and then maybe decide. But thanks for looking none the less, I really enjoy what I do and am happy when I get customers that come back to purchase more of my parts. This is a unique look and am happy to say I was the only person to come up with this set up and wanted to get it out there for you to all see. There is a lot involved to make this happen and that’s why it did take some time for me to get it how I really wanted it. Thanks again, I always appreciate your input, good or bad as it is what makes me drive harder to get what you want. 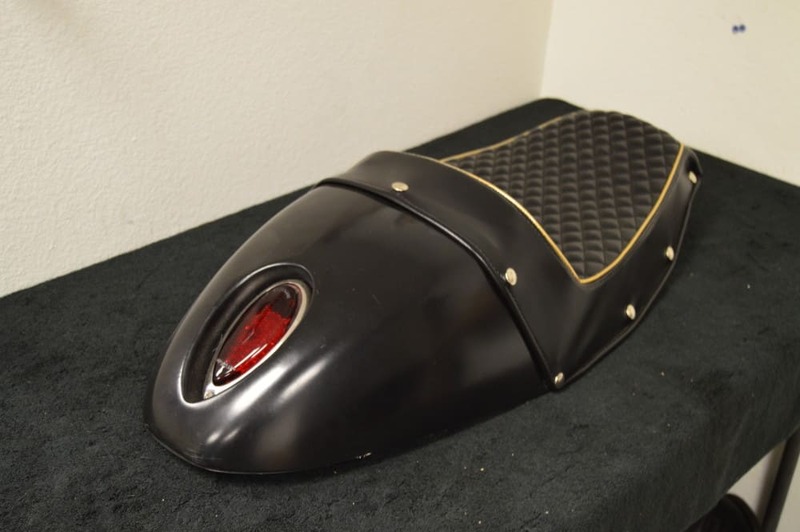 I have used stainless steel that was laser cut and bent in a Press to get the Hooks just right, I used Triumph Stoppers for the seat to Buffer on, New Foam and a New Fiber glass seat pan and then my new cowl with the recessed tail light. Then the Upholstery hand stitched and then snapped to give the old School look of years gone by. This entry was posted in Blog and tagged 59 club, 900 efi, ace cafe, bonneville, busy bee, cafe racer, classic bike, daytona, rockers, thruxton, ton up, triumph, trumpy, Twin.